As a webmaster, the more you know about your website visitors, the better able you'll be to target future promotions, stock changes, content and more to their needs. Google has a new tool that can help with this. Conventional keyword research can make it difficult to identify overarching trends within your industry. As an example, suppose you run a website that recommends different credit cards and bank accounts to personal finance readers. You want to know which banking brands are trending among your followers, but when you use your keyword research tool, you get a jumble of results that are hard to interpret. 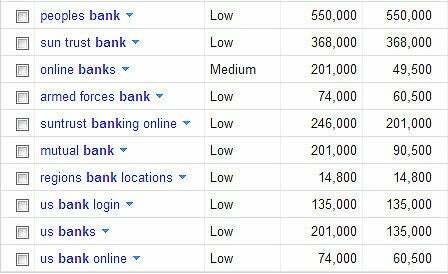 The keyword list above was generated using the search term "bank" within Google Adwords. Note that SunTrust Banks is represented twice on this list using different spellings. In order to get a complete idea of how many of your readers are interested in SunTrust Banks, you'd need to add all the different SunTrust related keywords together and compare your total against other aggregate options. This is where Google's new Top Charts feature comes in handy. Top Charts provides cumulative trend data in more than 40 categories. Essentially, these charts reveal the subjects that people in a given industry are most interested in based on overall search habits -- not on individual keyword volumes. Returning to our previous example, if you were a webmaster running a financial services website, this Top Chart would provide you with valuable insight into what consumers are actually interested in, without the hassle associated with adding together different keyword variations. 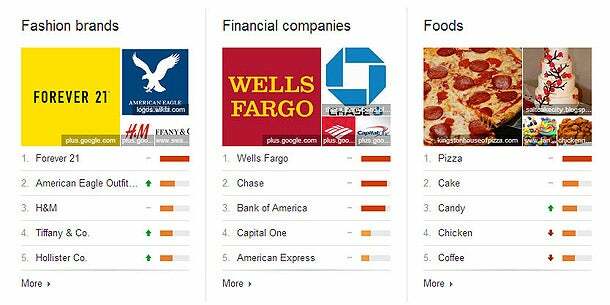 In this case, the "Financial companies" Top Chart reveals that consumers are most interest in Wells Fargo, Chase and Bank of America products. Featuring these companies more prominently on your website could lead to more referrals and greater reader loyalty based on the value of your "in tune" recommendations. Better-tailored promotions. By familiarizing yourself with the general trends found in Top Charts, you can determine which products or brands to feature most prominently on your website. While you'll still want to test your conversion rates amongst your unique audience, knowing which brands or products they've demonstrated the most affinity with in the search results can save you time when it comes to market research. Stronger blog post content. Even if you aren't able to make product line decisions based on Top Charts information alone, you can still use these trend indicators to inform your business blog's post content. By writing posts based on topics that you know are popular with Google search users, you'll improve the relationship you have with your readers, leading to repeat visits and increased social sharing. More relevant ads. Knowing what your target customers are interested in can also help you to whittle down your list of PPC keywords. If, for example, you see a certain product type you've been advertising for slip down in Top Charts popularity, that could be a good indication that your advertising dollars will be better spent elsewhere. Of course, Top Charts does have a few weaknesses from a market research standpoint. First, there are only around 40 industries covered, which leaves major gaps in the product's knowledge base. If you operate in a niche market, the data found in Google's Top Charts may be too broad for you to put to use. In addition, webmasters will want to be aware of the limits of such general information. Because Top Charts draws from data created by all search engine users, there's a chance that Google's reported trends won't be applicable to a site's smaller, more unique audience. If, for example, your personal finance website targets stay at home moms exclusively, you may find that their interests deviate from the whole-population trends reported in Top Charts. Even still, Top Charts can be an informative tool for most webmasters. Use the information found there to learn more about what your customers might be interested in and to structure future promotions, product line changes and more on your website. Just be sure to test any changes you make using split testing and other consumer research protocols to validate your assumptions and to create the best possible offerings for your target audience.